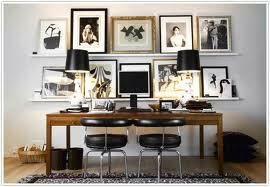 I just love collections of framed photos on a wall. Lately, I have been on a black & white photo kick and am having a lot of fun displaying them in my own home. 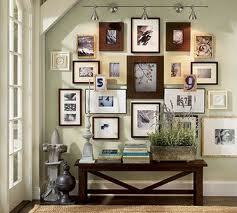 A wall of framed photos can be done in several ways. Here are a few tips. 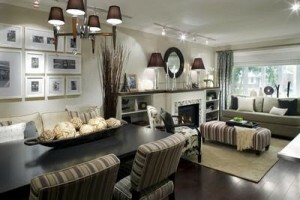 If you have a common element, you can have different shapes and sizes can still create a cohesive look. For example, If you have all black & white photos, the frames can be different colors. If the photos are in color, I prefer to stick to one color frame to avoid visual chaos. Also, a grouping of all one color frame will read more clearly as a whole, while a set of mix & match frames will create a more eclectic look. Create a large imaginary square or rectangle around the frames for a more graphic and symmetrical look, but vary the frame sizes. Or, decide on standard spacing between each frame (1-2 inches), as this maintains balance, but looks more organic. Controlled random! The center of your photo display should be at eye level (between 60-66”). Most art galleries keep art at 62″. Before putting nails into the wall, lay out the pictures on the floor.